Step I: Get the online form. Click HERE to download smart card license online form. Step II: Fill up the online form with correct information. Step III: Remember to provide your finger print and add your recent photo. Step IV: Submit the properly filled form to Department of Transport Management. (Note: Although you can download online form, you need to visit the office manually for form submission). 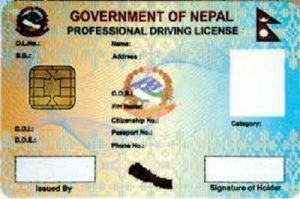 How can you get smart card driving license if you already have a written license? If you already have a written driving license, you can easily get a smart card license by giving full information and presenting the written license at the office of Department of Transport Management. What is Smart card driving license? Unlike traditional handwritten license, smart card is a digital card that comes with chip where all the information about the owner including personal details of owner, expiry date, type of vehicle that you use and information from bluebook of the card is stored. How does smart card license work? These information will be checked by the traffic police against smart card reader. Smart license comes with ten years of validity period unlike 5 years of validity of handwritten license.